I am trying to minimize the waste that my kitchen produces. I use cloth napkins and dish towels instead of paper towels. I try very hard not to use baggies…if I do I wash and re-use them. I switched from Tupperware to glass Pyrex containers for storage. I keep any plastic containers that food items come in, such as sour cream and crumbled cheese, to re-use when I send leftovers home with a guest or to pack snacks in for the kids. These simple measures have eliminated a ton of waste that my kitchen produces. I have found many new uses for my food containers. Many of these containers I used to simply toss in the recycle bin, now I give them a new purpose. Coffee creamer is a necessity to me. I hope to begin to make my own but until I do I use store-bought. I had been saving the containers knowing that there had to be a great use for them. 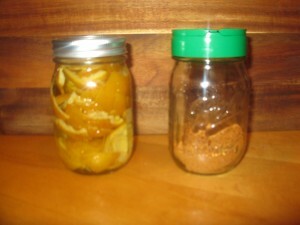 I make many of my own condiments and had been storing them in mason jars and using a spoon to serve them. The light bulb went off. 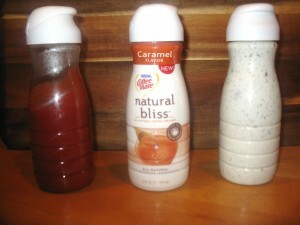 My creamer containers were perfect for storing homemade salad dressings (ranch and blue cheese) and homemade ketchup. I often use them to store craft items such as glitter and pom poms. I use glass mason jars for a ton of items. I freeze and store my homemade chicken stock in mason jars. I make my orange infused cleaners in them. And I love the fact that I discovered grated cheese lids are a perfect fit for mason jars. 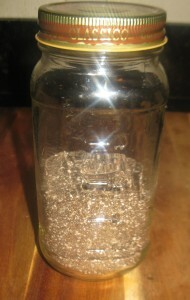 I use the lid on jars for homemade blackened and taco seasonings. 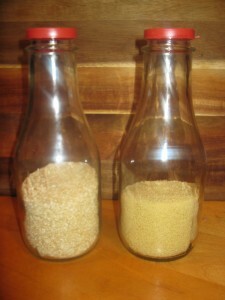 My glass organic milk jars are great to store dry items such as quinoa and couscous. They look nice on the countertop as well. I sometimes buy organic pasta sauce when I do not have time to make my own. These are great for dry kitchen items as well. I have my chia seeds on the counter in one now. My mom saves her spray and squirt bottles for me. 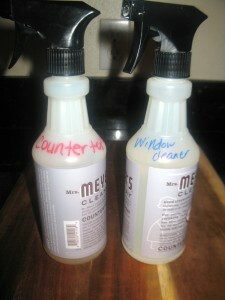 I use spray bottles for homemade household cleaners such as window cleaner and countertop cleaner. This is not kitchen storage but it certainly eliminates waste. 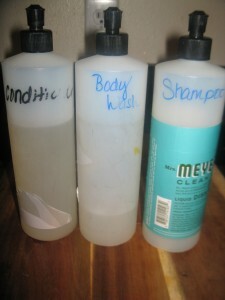 I use the squirt containers for my body wash and no ‘poo shampoo and conditioner. Every time I take an item to the recycle bin I give it a second thought on how I can re-use it in our household in order to eliminate the waste that we produce. 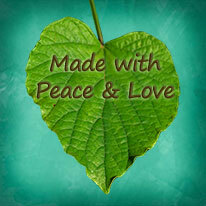 I would love it if you would share by leaving a comment on any ideas that you may have! Where do you buy organic milk in glass jars? And what is in your body wash recipe?